A "vector control" worker fogs a street in Bangkok. The best way to control dengue fever is to kill the mosquitoes that spread it. Dengue fever is endemic in Thailand. 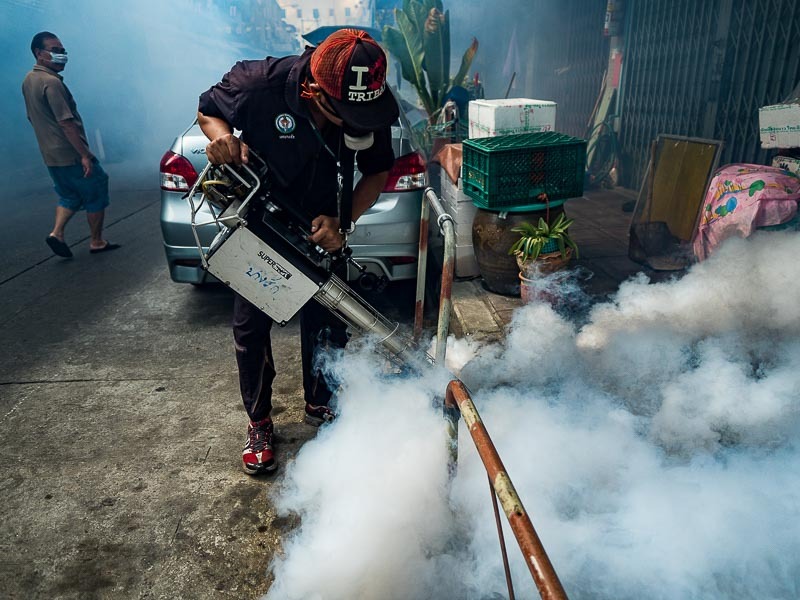 The mosquito borne virus infects tens of thousands of Thais every year and kills nearly 100. This year more than 100,000 people will be infected and well over 100 will die from the disease. According to the World Health Organization, there is no known treatment for dengue and there is not, yet, a vaccine for the disease. About half of the world's population is at risk, including parts of the United States (health officials in Hawaii are currently battling a dengue outbreak). At this point the only way to prevent dengue is mosquito avoidance - not getting bit by mosquitoes. 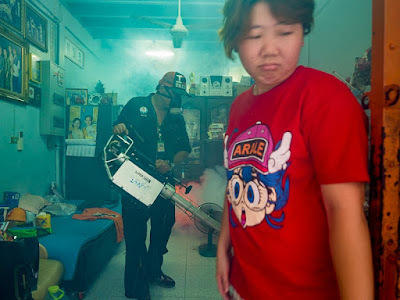 A woman tries to get out of her house while the mosquito assassin fogs the living room. The disease is spread to humans by the bite of the Aedes aegypti mosquito. The mosquito becomes a carrier when it bites an infected human. 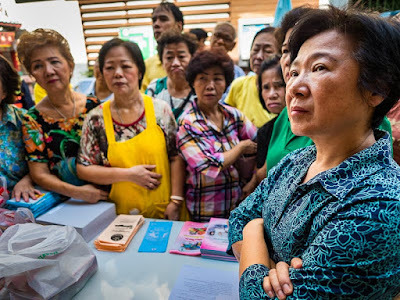 So while the disease doesn't spread person to person (like, for example, the common cold does), if one person in the community has dengue and is bitten by a mosquito that is not carrying the virus, that mosquito then becomes a carrier. 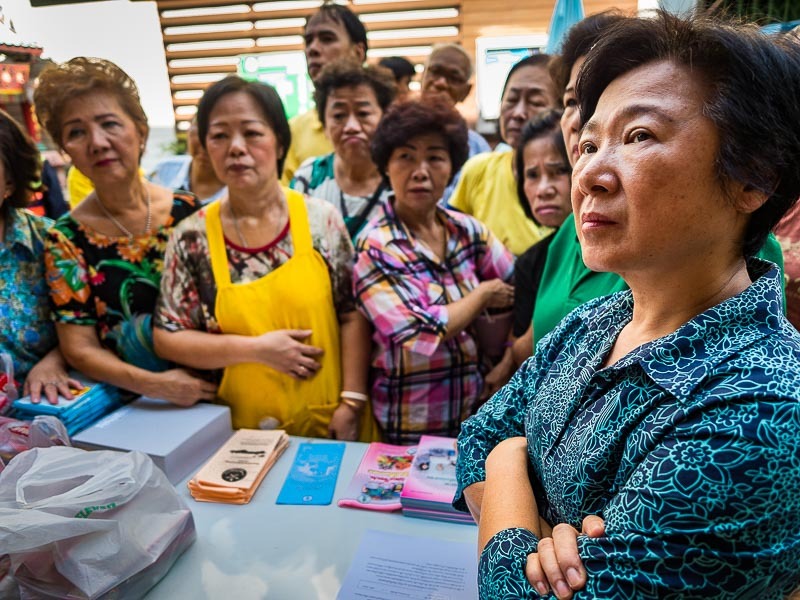 Women participate in a public education session about preventing the spread of dengue fever. The mosquitoes that transmit dengue thrive in urban areas. The mosquitoes live in stagnant water, Bangkok's khlongs, many of which have been partially filled in and dammed, along with the Thai practice of storing water in large ceramic jars, called khlong jars, are a perfect environment for the mosquitoes. Public health officials have become very aggressive about spraying and fogging to kill the mosquitoes. Teams go to different parts of the city every day to do outreach and education about the disease and "vector control" or killing the mosquitoes. Dengue fever is on the march globally. According to WHO, up to 1970, only nine countries experienced severe outbreaks. The disease is now endemic in more than 100 countries, including the US and Europe. There was a dengue out break in Florida in 2013, there is currently one in Hawaii. Dengue was locally spread in France and Croatia starting in 2010. 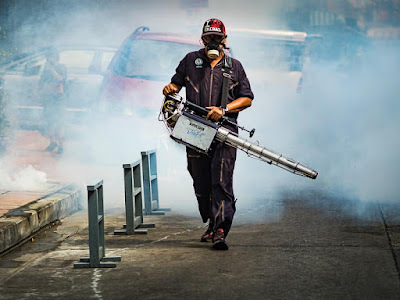 The vector control worker walks down a street after fogging the neighborhood. Dengue is relatively easy to treat if it's caught early. Mortality can be reduced to under 1% if it's caught early and treated with bed rest and fluid replenishment. I went out with a dengue treatment team this week to photograph the vector control (fogging and killing mosquitoes) and public education. There are more photos of the mosquito control workers in my archive or available from ZUMA Press.